OK, OK, it's not lunchtime, but with that small detail overlooked let's get down to business. 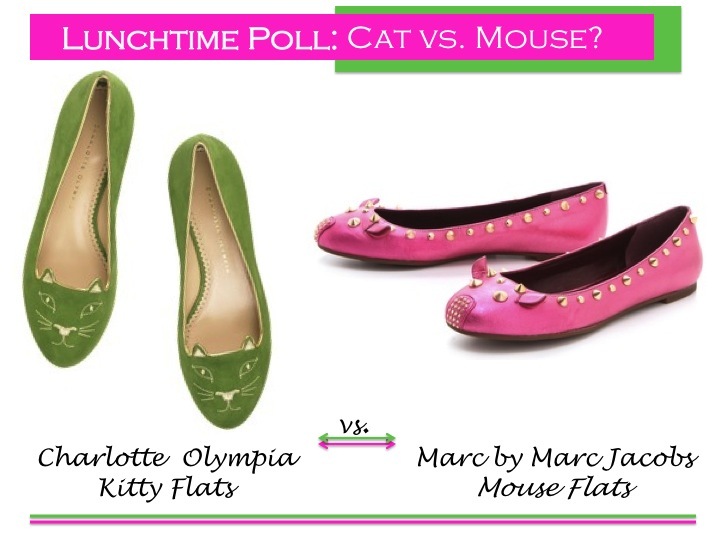 If you had to choose, would you step out in Charlotte Olympia Kitty Flats or Marc Jacobs Studded Mouse Flats? Both come in a variety of colors and have cute little ear details. The difference here is that the Kitty flats come in the form of a must have smoking slipper and the Mouse flats embrace the tough love stud trend. So hard to choose. They are both adorable. Thanks for your comment dear, I just followed you. Can you make the same on my fb fanpage, I would really appreciate it! I want bought of them :). Your blog is amazing!! I'll follow you in bloglovin! I have been loving the mouse flats..they are adorable! I think I'm leaning more toward the mouse flats. Both are absolutely adorable though <3 Thanks for the love on my blog! Yours is amazing and I'm now following! both! haha, i have the MJ mouse flats, and those mice are too cute! MARC marc MARC. he always wins. I love both of them - they are so adorable! My favourite has to be the mouse shoes though! so cute! i want it!! Both are SUUUPS cute, but I'd have to go with the cat flats! How fun are these! I vote mouse flats! Love the color and the studding detail. Thanks for coming over to my new blog, love! I love marc jacobs one:they are so amazing! I love marc jacobs!! !I have find your blog and I follow all your news post because all are interesting!! !I invite you to visit and follow m blog if you like it, i hope that! These flats are SO CUTE! Love the green ones especially. Kitty flats, definitely! I really want a pair in black.